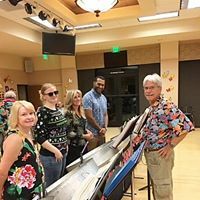 began in 1997 at Desert Winds Elementary School with 8 members. Since then, the group has grown to 15. This is due to the fact there is an evening adult class in steel drums that has produced 5 CDs. The group appeals to audiences of all ages and has opened in concert for Jimmy Buffet. The size of the instrument varies from one pan to another. It may have almost all of the "skirt" (the cylindrical part of the oil drum) cut off and around 30 soprano-range notes. t may use the entire drum with only three bass notes per pan, in which case one person may play six such pans. The length of the skirt generally corresponds to the tessitura (high or low range) of the drum. 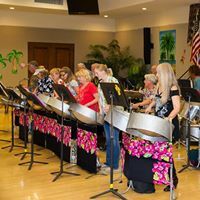 There are several ways in which a steel pan may become out of tune (most commonly this is caused by playing the steel pan with excessive force and incorrect handling). A tuner must have great skill in his/her work to manage to make the notes sound both good and at the correct pitch. Much of the tuning work is performed using hammers. For many years now there have been attempts to use the steel pan in various contexts other than those with which it is stereotypically associated. 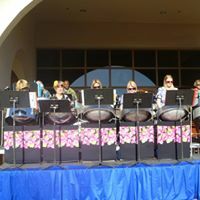 The first known use of steel band in a theatrical performance (outside of Trinidad and Tobago) was in Harold Arlen's 1954 Broadway musical House of Flowers, in which Enid Mosier's Trinidad Steel Band performed in several songs. British composer Daphne Oram was the first composer to electronically manipulate the sound of the steel pan after recording a band (probably Russell Henderson's Steel band) in 1960. [Wee Also Have Sound Houses; BBC Radio 3; Sunday Feature; 3 July 2008] The first use of pan in a commercial pop record was by The Hollies in 1967 with "Carrie Anne". [Thomas; Forty Years of Steel; p.56.] Loggins and Messina feature steel drums on the song "Vahevala"
from their 1971 album Sittin' In.